The LED Lenser NEO6R is a lightweight head torch designed with running in mind, but is equally as good for hiking, camping, dog walking and many other activities where a lightweight head torch is preferred. As well as featuring the standard LED Lenser smart light technology, the NEO6R also incorporates a wide beam reflector. This gives the user a wider horizontal illumination for better peripheral vision and the virtually glare free optics combined with the swivel mounted head lamp unit allows you to aim the beam where required and prevents you from dazzling others. The NEO6R is powered by a lithium-ion battery pack that sits on the back of the head. It is connected to the head lap via a cable that can be disconnected to prevent accidental activation. For the light to work slot the headlamp side of the cable into the battery back side of the cable and then twist the headlamp side of the cable upwards to lock it into position. The battery pack is recharged using the included micro USB cable. Remove the coloured silicon cover from the front of the battery pack to reveal the micro USB port. Plug the cable into the battery pack one end and the other end into a computer/laptop or into a USB car/mains adaptor that can be purchased separately if you do not already have one. A charging light will glow red to show charging is in progress and will turn green once charging has completed. Another safety factor of the NEO6R is the blink function, the forward facing white LED provides blink mode and there is also a rear red LED, enclosed within the slimline battery pack, that will allow you to be seen from behind. Two modes of either constant current or energy saving are available. Constant current mode will maintain the brightness output until the batteries run out, whereas energy saving mode will gradually decrease the brightness output as the battery level drops. The small button on the right of the head lamp controls all the functions of the NEO6R. Press the button once to turn the light on in constant current mode as default. The light will be on high and the rear red light will stay solid for 5 seconds to indicate you are in constant current mode, after 5 seconds the red light will change to blink. A second press will enter low with rear red blink and a third press will enter white blink with rear red blink. Hold the button down for 1 second in any mode to turn the light off. To change between constant current mode and energy saving mode hold the button down for 5 seconds with the light off. The light will blink once for energy saving and twice for constant current. When the battery level is low the main light will blink three times to warn the user to charge the battery. A lockout function prevents accidental activation when not in use and is locked by holding the button down with the light off for 8 seconds and unlocked in the same way. 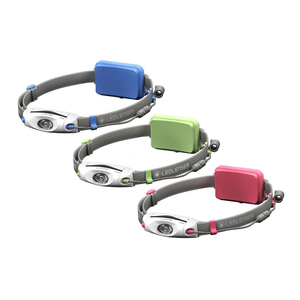 A chest belt to mount the NEO6R on your body is included and is good for night running or group activities so not to shine the light directly at someones face.